Last summer the nice folks at Knit Picks asked me if I'd be interested in designing something in one of their new yarns. I chose to work with Capra, a DK weight yarn of merino and cashmere. Needless to say, the resulting sweater is extremely soft. 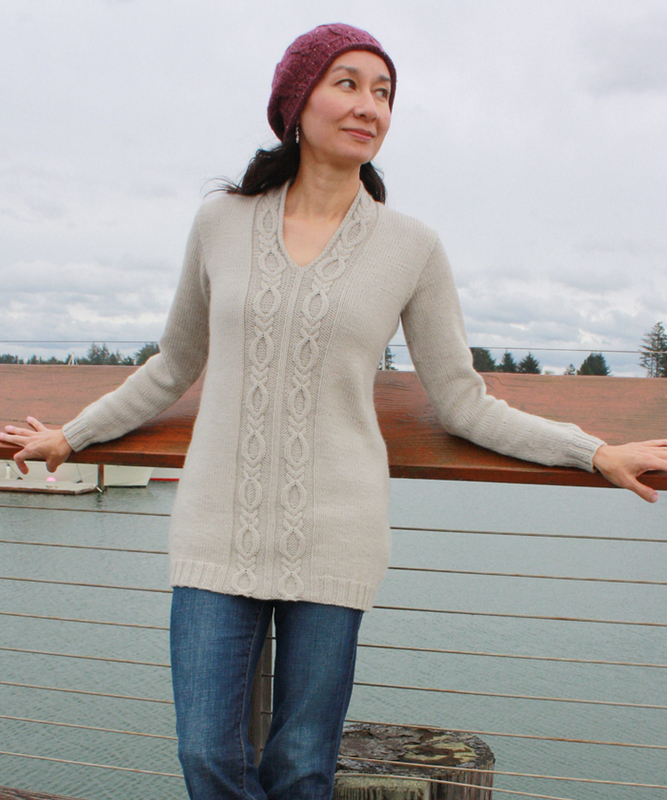 Talise is a close-fitting, tunic-length pullover. 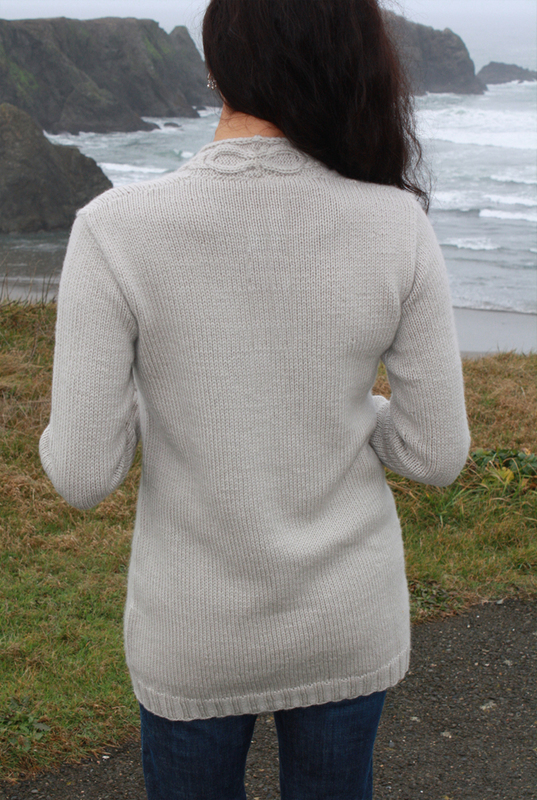 Worked in the round from hem to yoke, front and back are then separated and knit flat. Sleeves are picked up around the armhole and knit in the round. 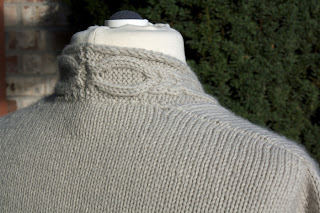 Bold cables extend into the collar which is seamed in the back. Errata notice, 3/24/2011: The original pattern contained errors in the chart legend and in the written chart directions (page 5). Many apologies! For 2/1 RPC it should read: Slip next st to cable needle. Hold in back. K2, p1 from cable needle. Written chart directions should read: Circular: work every rw from right to left. Flat: Work odd numbered rws (rs) right to left, even rws (ws), left to right. Zero to 2"/5cm positive bust ease. Sample shown with 1"/2.5cm ease. needles: 24"/61cm and 16"/41cm circulars in US 6/3.75mm and US 7/4.5mm. Dpns in US 6/3.75mm and US 7/4.5mm. If necessary, change needle size to get gauge. yarn: 10 (11, 11, 12, 12, 13, 14, 14, 15, 16, 16, 17) skeins Knit Picks Capra, DK, in Platinum, 85% Merino Wool, 15% Cashmere, 123 yds/112 m, 50g. Approximately 1182 (1272, 1326, 1417, 1471, 1561, 1615, 1705, 1759, 1850, 1904, 1994) yds/1081 (1163, 1212, 1296, 1345, 1427, 1477, 1559, 1608, 1692, 1741, 1823)m total. other: cable needle, tapestry needle, stitch markers, scrap yarn or stitch holders. gauge: 20 sts and 28 rws in ST st over 4"/10cm. Center panel for sizes 32-38, is 34 st over 5¼"/13.5cm, for sizes 40-46, 38 st over 6"/15cm, for sizes 48-54, 42 st over 6¾"/17 cm. stitches and skills: 2x2 rib, cables, decreasing, k2tog, ssk, straight stitch, knitting in the round, picking up stitches, seaming. 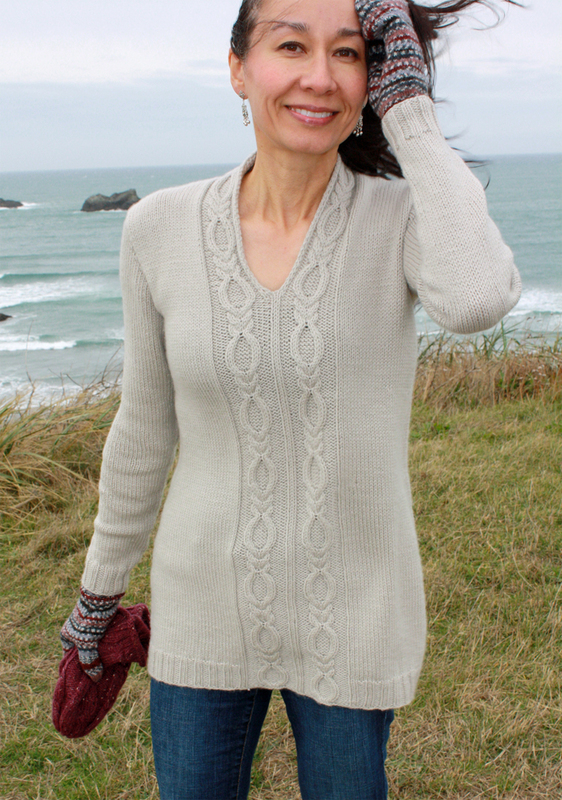 See page 4 for details on 3-needle bind off and short-rows. I love this sweater so very much. Beautiful work!